Product information "Razor(TM) TVMV Protease"
Ready for use. Recombinant TVMV protease with an N-terminal His-tag for simple removal from the cleavage reaction by immobilization on metal-affinity resins. TVMV protease cleaves the sequence ETVRQS, with cleavage occuring between Q and S residues with high specifity. It is mainly used for removing affinity tags from peptides. 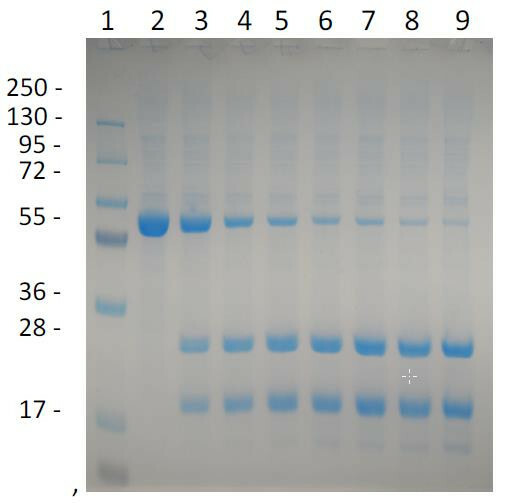 Affinity tags are often applied to facilitate the expression and purification of recombinant proteins. Whereas many tagged proteins retain their structural integrity and biological activity, others clearly do not. Therefore, whenever possible, it is prudent to remove tags from recombinant proteins. The tobacco vein mottling virus (TVMV) protease is a close relative of TEV protease but, with a distinct sequence specificity. Customer review for "Razor(TM) TVMV Protease"